This guide is intended to help you understand the cloud provider role in a Kubernetes cluster and the Kubernetes architecture itself, introducing the changes in the upcoming releases and guiding you with a pratical example using OpenStack as the cloud provider. First of all, it’s needed to understand a little bit about Kubernetes core architecture to know what components interact with the cloud. Kubernetes integrate with cloud providers to get information about available nodes, to create load balancers for services and to configure persistent volumes. These actions are performed by multiple Kubernetes components, called kube-controller-manager and kube-api-server, running on the kubernetes masters, and kubelet, running on the nodes. 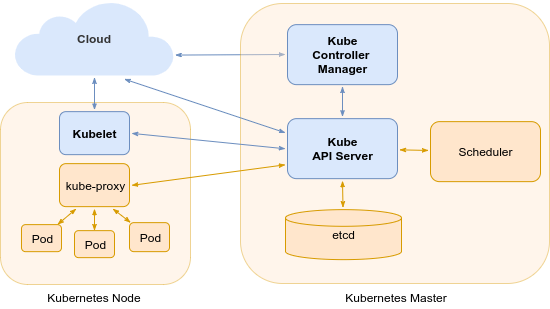 Kubernetes Controller Manager (KCM): In Kubernetes, a controller is a control loop that watches the shared state of the cluster through the API server and makes changes attempting to move the current state towards the desired state. The KCM embeds the core control loops shipped with Kubernetes (e.g. replication controller, endpoints controller, namespace controller, and serviceaccounts controller). Kube API Server: It validates and configures data for the API objects (pods, services, deployments etc), and provides the REST operations to manage them. Kubelet: It’s is the primary node agent, reporting the node status, running the pod’s containers, mounting pod’s volumes, downloading the pod’s secrets, and executing container liveness probes. My setup has four kubernetes nodes, one master and three worker nodes, this means that my kubernetes master has kubelet and kube-proxy, because it is also a cluster node that runs only kubernetes master components, that runs as pods too. How to create my cluster Kubernetes with the OpenStack cloud provider? Well, there are many ways to do it, for this one, you only need an OpenStack ready and the kubeadm tool, whose function is to bootstrap clusters magically. I hope to make a more advanced post using it in the near future. Follow this guide to get it. Tricks: As you follow the guide above, you will need open some ports for master nodes and others ones for worker nodes. Create the security groups “k8s-master” and “k8s-worker” on OpenStack (Access & Security -> Security Groups, on Horizon) opening the required ports. It’s possible to create a custom script to do the all other things described in the guide, making your Instances will be ready for Kubernetes at launch moment. Once you’ve set up kubeadm, you can start it on the master node. I’m using the v1.8.1 Kubernetes version. I will use Calico as the overlay network, for enabling the pods to communicate with each other, so I need to pass the flag --pod-network-cidr=192.168.0.0/16 in the kubeadm init routine. For more information/options see the docs. After this command, three steps are shown in the output, the first one is to create your $HOME/.kube/config file, basically, this file contains the IP and port of your API server and the auth information to access it. The kubeadm tool already created the Kubernetes core components and you already bootstrapped your cluster. Each cloud provider has the own configuration, here is a simple example of to OpenStack. You should create this file for all nodes, including the master. The kubeadm creates the manifests files in the /etc/kubernetes/manifests by default, in this path you can find kube-controller-manager.yaml and kube-apiserver.yaml. You should edit them, in the master node. Basically, you should add the cloud-provider and cloud-config args and mount a volume pointing to your cloud-config file. Once you edit correctly this file, the KCM and the Kube API Server will be restarted. If you recieve the message The connection to the server x was refused — did you specify the right host or port?, don’t be a worry, the Kube API server is restarting, it’s normal to lose the connection with it. Good news! You already have you kubernetes clusters with in-tree OpenStack Cloud Provider. Good news again! All in-tree cloud providers will be pushed out of Kubernetes core! but don’t be sad, there is a great refactoring in progress, introducing a new architectural element, called Cloud Controller Manager, which I will address in the next part (2/2) making Kubernetes increasingly pluggable with any cloud providers. See ya.